Ipsy sends everything in a cute bag each month! If you are not familiar, Ipsy is a monthly beauty sample subscription service. Unlike the Allure box, this one is much more customized; with ipsy, you can compare bags with friends, and its possible that you all got different items! I always look forward to discussing the items with other subscribers. You take a quiz when you sign up, and you select preferences on the types of items you like (for example, if you’re more into nail polish than lip gloss), they select your samples based on that. Another way you inform them of your preferences is by reviewing your samples every month. 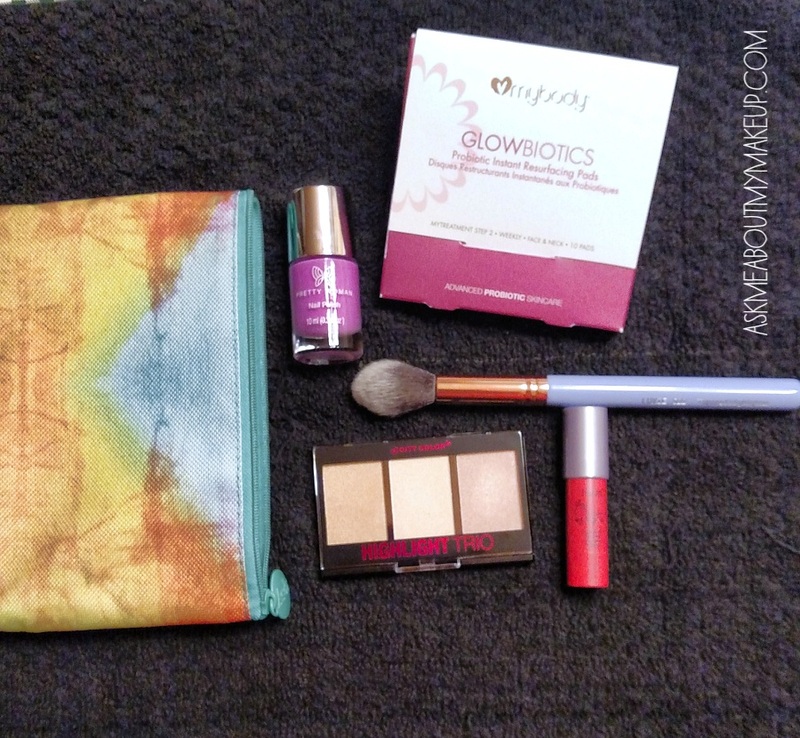 Something else I enjoy about Ipsy is that each month you get your samples in a new makeup bag. The styles are always different, if one isn’t your taste, it’s likely you’ll get one you love in another month. I do like this one, but there have been a few major favorites in past months. The products this month are pretty awesome too! I’ve had tarte Lipsurgence products before, and this one is a very pretty warm pink. I’ve always found that while these lip colors don’t have a lot of staying power, they are very comfortable on the lips and easy to apply quickly. I’ve never tried Pretty Woman nail polish before, but this purpley-pink (almost orchid?) color is really fun and I will definitely use it- possibly for a pedicure. I’ve gotten products from City Color before, in fact, I got those from Ipsy too! This highlighter set is very nicely made, and the powders are nice and smooth. I don’t use a ton of highlighter, but these make me want to play around with highlighting more! This bag feels very well put together, receiving a highlight palette and a highlight brush in the same bag is very handy! The brush is full and soft, and I think will work quite well for its intended use. This last item kind of surprised me, I don’t often get fancy skincare items from Ipsy, but I certainly don’t mind- I wouldn’t subscribe if I didn’t like trying new things! “Resurfacing” pads are essentially a chemically-soaked exfoliant disc, which can seem scary but its just another way to slough away dead skin cells to make the skin smoother and more radiant. Some exfoliants can be very hard on the skin, so whether it’s primarily physical or chemical, its important to be gentle when exfoliating! When I haven’t tried a new exfoliant, I prefer to test them first. I will likely to test one of these pads on one of my arms and then wait a day to make sure there is no reaction before using it on my face. I have been getting Ipsy for about 3 years now, and I always look forward to that puffy pink mailer arriving ; I have discovered some great products through it, but I also have learned what I don’t like in different beauty products, which is very helpful to figure out. Do you get Ipsy? What do you think of my bag this month? Do you get an entirely different subscription? Tell me about it, I would love to hear from you! I liked my bag too! The only thing about the highlighter was there wasn’t a lot of pigment in the colors, but it’s nice that they do go with a lot of different skin tones, and some are better for evening & some for day. My nail polish color was a really pale grey, and looked great, but chipped super easily. Let me know if that happens with yours. I will definitely report on my polish, I have very stubborn nails, so any polish that can stay put for a few days earns gold stars from me! I liked the highlighter set because the colors were subtle and not too heavy, I prefer a subtle highlight. I also think they could be used on the eyes, or even to add a bit of shine to a lip color! I recently purchased the new highlighters from Glossier. There’s a dark and light color…. Bought both. They are game changers. Go on so smooth and blend great. Used the darker one for contouring since I am a very pasty pale color, and the lighter one for, well, highlighting. Just enough shimmer, but I don’t look like a 10-year old trying makeup for the first time. I also bought Benefits’ “Watts Up” highlighter, which is ah-mazing! It’s a cream to powder stick that is somewhere between the two Glossier shades. Blendable, buildable, great pigment, and seriously amps up my look in the best way. I think I might have a highlighter problem. Anyway- point is if you love highlighters (which I do, especially now that it’s summer) those are both great options. Great post. I was checking constantly this blog and I am impressed! Very helpful information particularly the last part 🙂 I care for such information much. I was seeking this certain info for a long time. Thank you and best of luck.